A delicious creamy side dish. Heat the broiler on low. Put the whole head of cauliflower in the microwave on "fresh vegetable" or appropriate setting. Let cool ten minutes. Melt butter in a sauce pan, add panko bread crumbs and set aside. Add 1 teaspoon butter to pan. Add flour and stir for one minute. Slowly add heavy cream. Stir until thickened. Add in cream cheese and stir constantly until cream cheese melted and sauce is smooth. Chop cauliflower into bite sized pieces - put in an oven proof dish and sprinkle bread crumbs over the top. Broil until the top is nice and bubbly. 154 members have added this recipe to their cookbook. How much is a serving? 1/2 cup or 1 cup....I am super new to this and doing WW and would really like to see the serving sizes on the recipes if at all possible. Quick cauliflower side done in the microwave. A vegetarian ceviche that is easy to make. With chicken and veggies you have an all in one meal that comes together in a flash. 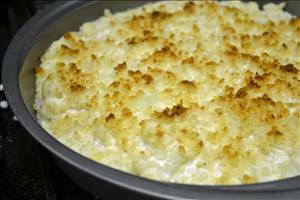 There are 120 calories in 1 serving of Cauliflower Gratin. Calorie break-down: 27% fat, 52% carbs, 21% protein. 1 other member has added this recipe to their cookbook for The South Beach Diet, Phase 2.